The Richell Premium Plus Freestanding Pet Gate is in a class of its own! 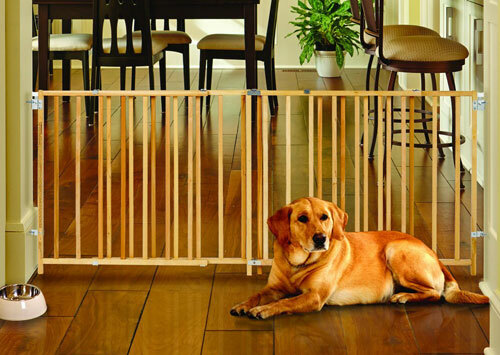 Pet gates can really feel obstructive and break up the flow of your home. 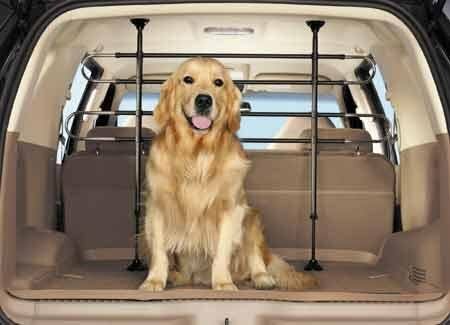 A freestanding pet gate allows you a lot of flexibility and convenience for setting up and moving spaces for your pet. Some pros of freestanding models are that they are easy set up, do not required hardware, and can be totally put away at a moment’s notice. While that all is great, there are some drawbacks to freestanding models. In order for freestanding models to be sturdy, they often need to be smaller than their wall or pressure mounted peers. This means that freestanding gates typically only function for animals that weigh around 30 pounds maximum. 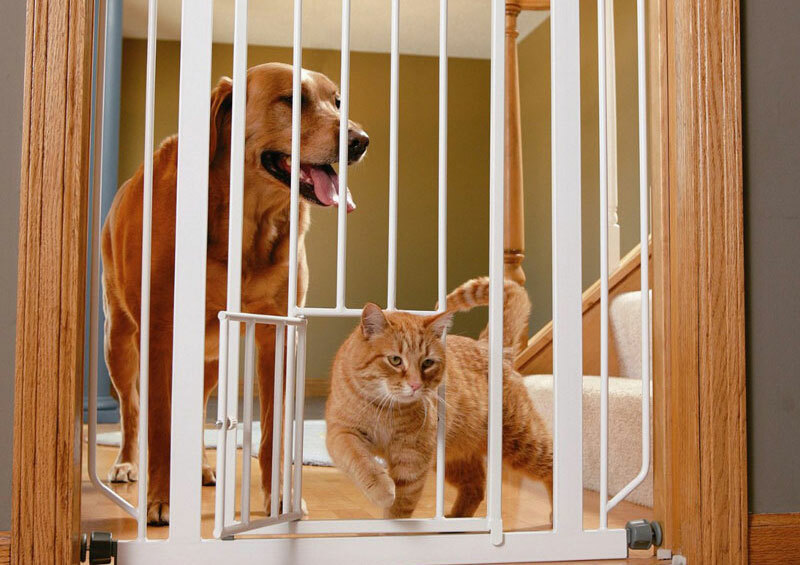 If your pet is the right size though, a freestanding pet gate can be a great option. 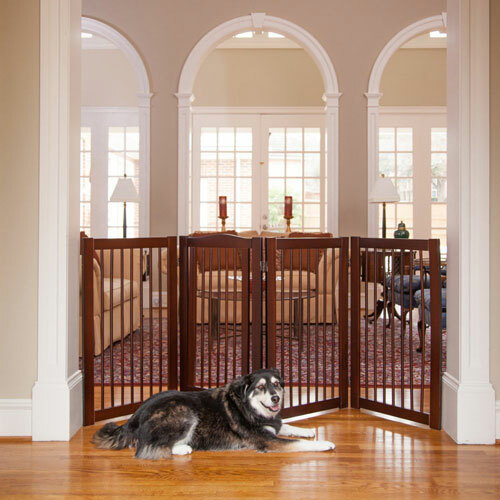 Below we’ve put together a list of what we have found to be good freestanding pet gate options, and we hope it helps you find the best model for your home. 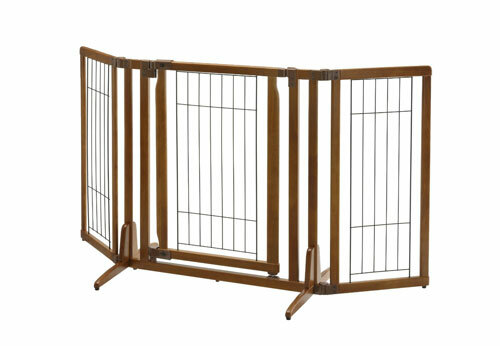 Hopefully the comparison chart above is useful in getting a quick sense of the variety of freestanding pet gates that are available at different price ranges. Below we’ll highlight a few of and go into more detail on each. 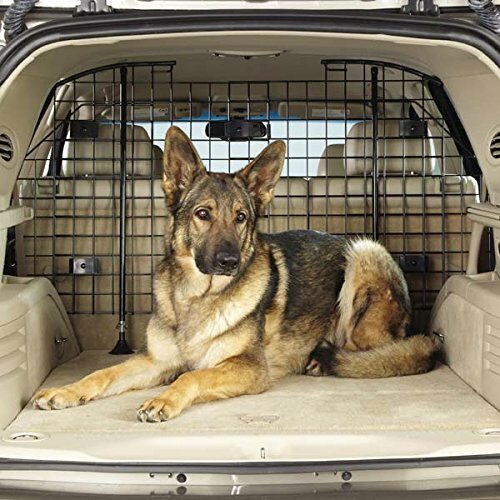 The Richell brand is responsible for a line of highly praised freestanding pet gates, the Richell Premium Plus Freestanding Pet Gate with Door being one of the best. This gate is rather large for a freestanding model. It can span up to 63 inches wide and stands at 32″ tall. For frame of reference, most freestanding gates only stand at around 24 inches tall. This gate is composed of three panels, a center panel and two side panels. The side panels adjust in 10-degree increments to allow for various configurations as needed. It is made from Rubberwood and 7 gauge metal wire, and the bottom is capped with rubber feet to protect floors. An unusual, but convenient, aspect of this gate is that it includes a door. This door is 20.5 inches wide, and locks at both the top and bottom for extra security. 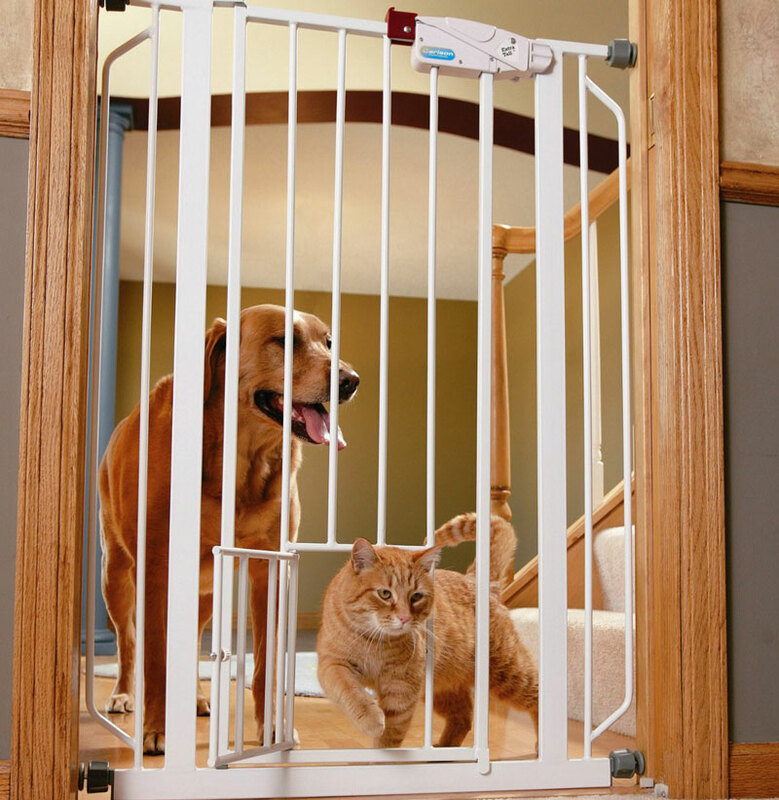 The PRIPM Primetime Petz 360˚ Configurable Gate with Door is the tallest gate on our list. It stands at 36 inches tall, which makes it a giant in the world of freestanding pet gates. This model is also rather sizable in width, and can span spaces up to 80 inches wide. It is composed of four panels connected by specialty hinges. These hinges allow panels to rotate 360 degrees, making basically any configuration you need a possibility. A walkthrough door is included in the center of this gate. The door opens both inwards and outwards for convenient pass-through. This gate comes in elegant wood construction, and makes use of rubber pads prevent sliding and protect floors from damage. This gate has style. The Carlson 68-Inch Wide Adjustable Freestanding Pet Gate is beautifully constructed out of premium New Zealand Pine wood and metal wire. This model stands at only 20 inches tall and is only meant to accommodate small dogs or puppies. It can expand to up to 68 inches wide. 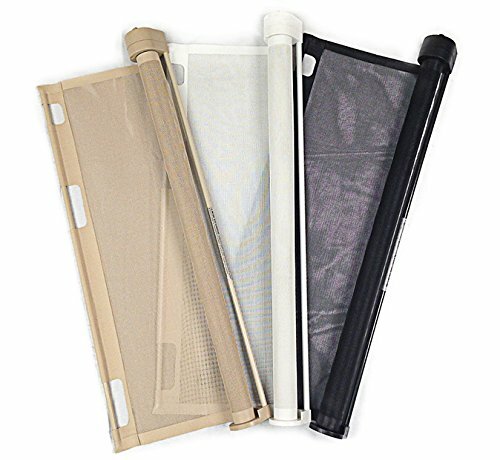 It expands easily by making use of a patented locking system. The locking system consists of latches on top of the gate that lock different widths into place.